I read a lot. All day long I’m reading, whether it’s blogs, Facebook, actual paper books, on my nook, to the kids….. I tend to be rather obsessive with my subject matter, too. Forgive the cell phone photos…. The upper left corner is Peter Grey’s Apocalyptic Witchcraft, which I recently finished and reviewed here. The upper right is Elizabeth U. Harding’s Kali: The Black Goddess of Dakshineswar. I’m glad I read this, even though it had several chapters that I skipped because I didn’t care about the founding of the temple. However, reading about Kali pujas in their native context was both interesting and informative. The lower left is Lee Morgan’s The Deed Without a Name, another book on Traditional Witchcraft. I finished it a few days ago. I am not sure what I was expecting. This was far more poetic than I was expecting, as informative as I was expecting, and in some cases quite different from my personal experience. I do not feel qualified to say much more about this book – either from a scholarly stand point or a practitioner one. The lower right book is yet another book on Traditional Witchcraft, Children of Cain by Michael Howard. I’ve only just started it and I’m in the second chapter. I like looking through authors’ end notes and bibliographies before I begin a book; that helps me see their large picture agenda, where they got their information, and a bit about their thinking. I noticed this book has a 50 page glossary! Whoa. I contemplated jumping straight to the chapter that talks about Victor Anderson and the Feri tradition, but I’ve chosen to read chronologically. My son loves to listen to chapter books. I’ve been reading him chapter books since he was an infant. We recently finished Farmer Boy, the third book in the Little House on the Prairie series. They’re so wonderful to read aloud. Very simple writing, yet engaging. A few nights ago we started Kipling’s Puck of Pook’s Hill. It is a story composed of tales and poems. There’s a lot of history and symbolism that goes straight over his head, but he’s engrossed. 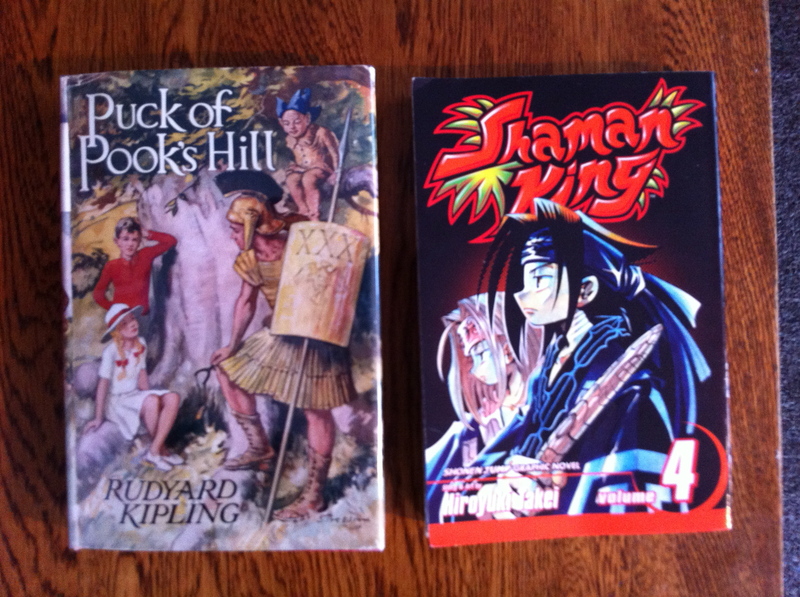 During the day we are whizzing through the Shaman King manga series. Since I took this picture we finished book 4 and are on book 5! I have been pleasantly surprised to see how much of the shamanism is based on actual lore and legitimate research. Right now the main character, Yoh, has to battle an Ainu. There are, of course, gross liberties taken with the shaman powers, but overall, it’s a great conversation starter with my son about magic, the spirit world, and how and why we seek power. She’s getting interested in books. She has limited ability to sit and listen to chapter books. She loves to listen to the Shaman King books – of course, they are graphic novels so she follows the pictures. 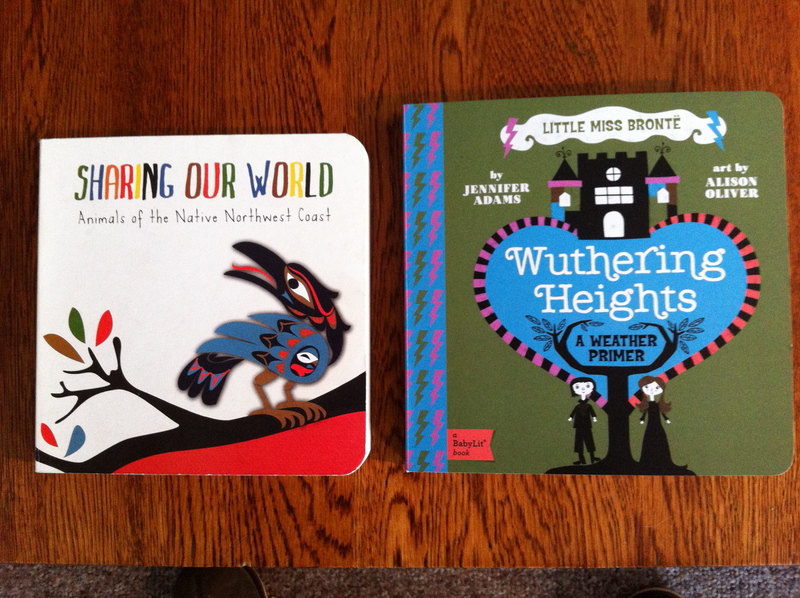 The two board books in the picture are on heavy rotation right now. This entry was posted in Uncategorized and tagged books, family life, Feri, Hinduism, Kali, pagan, witchcraft. Bookmark the permalink. 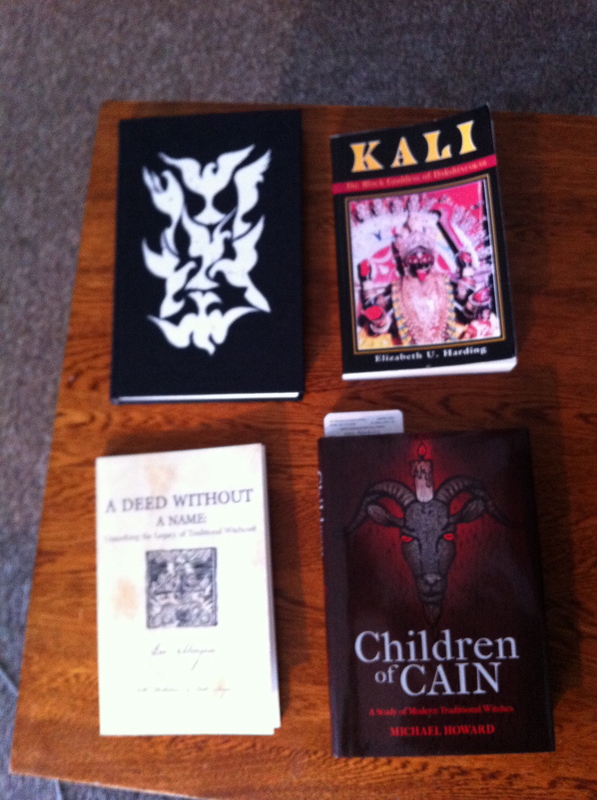 that kali book is a favorite of mine. Can you tell me why? What about it makes it a favorite? Wonderful! I’ll have to pick that up.